Ok a few things. The other day I am scrolling through my Facebook feed the other day and I see The Sweet and Savory Sisters’ recipe for real authentic beignets. Not fried biscuits…beignets out of made from scratch batter. The real deal. The full enchilada. Well, the deal was sealed and I knew right then and there that those babies would be on our table at some point this weekend. We all love Cafe Du Monde, right? It is the quintessential NOLA experience. Well, these babies will take you there. If you have never been, first of all, bless your heart because you are missing out and second of all, the taste of these beignets very closely mimics theirs’. Now, naturally, the ambiance that makes Cafe Du Monde what it is, is missing. But with a plateful of these and a cup of cafe au lait, you can almost close your eyes and make believe. They are that good. The almond extract makes all the difference, much to my surprise. This recipe is very simple and quick to pull together. You just need basic ingredients and cooking oil. 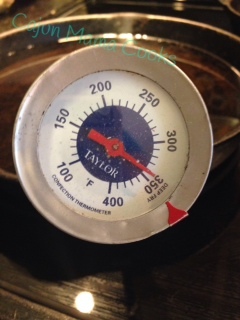 I had an oil thermometer and it really made the job super easy. Your oil needs to be at 375 degrees and stay there as consistently as possible. My beignets came out perfectly browned and ready for all that delicious powdered sugar. I am pretty sure these will be a Sunday morning tradition in our house from here on out. And I hate to fry. So for me to say this, it tells you how little trouble these were. I encourage you to bring a little bit of NOLA home, no matter where you live. On a spring day, when the birds are chirping and the morning air is a little crisp, you will almost swear you can hear the jazz music and the church bells ringing at St. Louis Cathedral (you can tell I have usually been to Cafe Du Monde on Sunday mornings). And best of all…you don’t have to wait for a table! 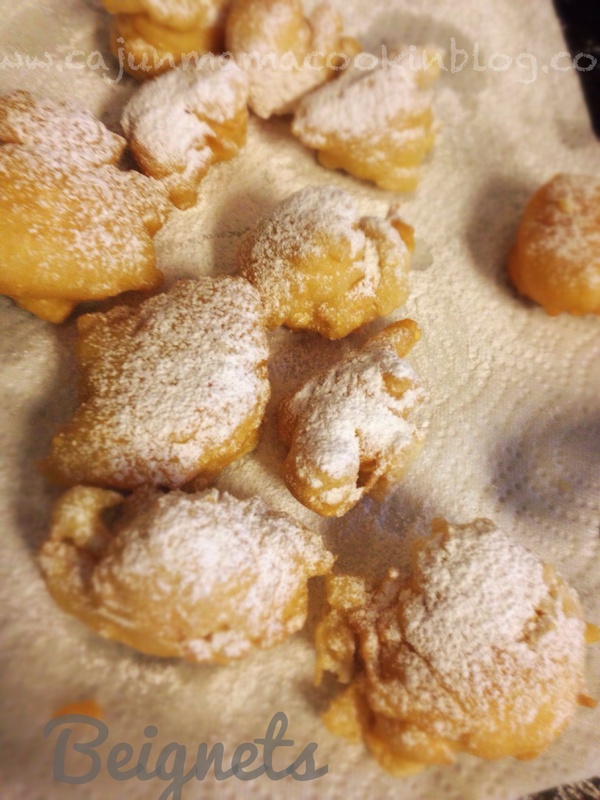 Get the powdered sugar ya’ll…it is time for some beignets! Now, the other thing is that I love the Sweet and Savory Sisters. These girls have roots in Avoyelles Parish, which makes them just a little more precious to my heart. My good friend, Angie, turned me on to them. Like with many of my good friendships, Angie and I both love to cook and she loves good recipes. I knew we were destined to be close when she barely knew me and emailed me a recipe for the best roast for poboys I have ever had. Makes a poboy so close to the ones in NOLA that you will swoon. You will want to slap your mama even if she is the most precious lady you know. So, she continued to forward me their recipes. I finally started getting their Facebook feed…that was a game changer. These girls are flipping hilarious, love to cook and have a good time, yeah Cher!! My kind of chicks. So, maybe check them out. the grease is gettin’ hot baby! Mix water, milk, egg, and almond flavoring. 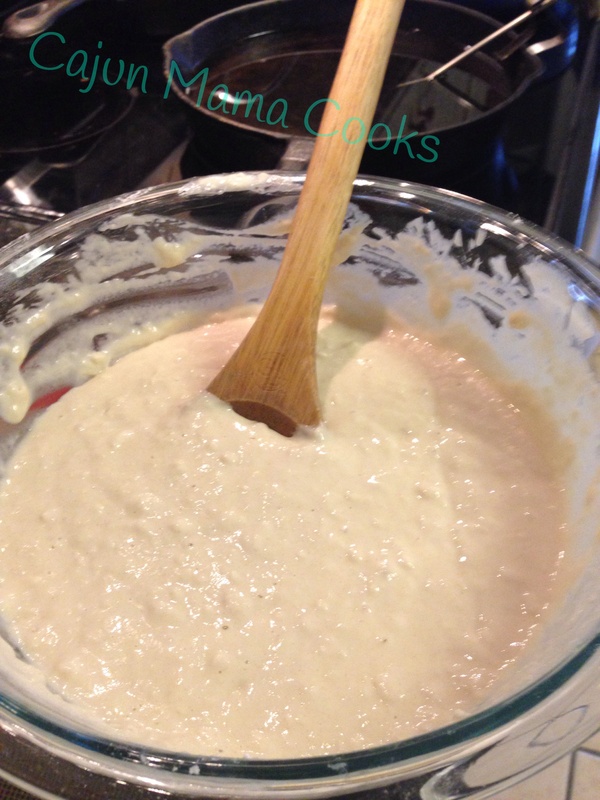 Add flour, baking powder, salt, and sugar; mix until smooth. Drop by spoonfuls into 2 inches of grease heated to 375 degrees. Turn once to ensure even cooking. Cook about 2 minutes on each side, depending on size it may take longer. Drain well on paper towels and sprinkle (ok..douse) with powdered sugar. OOOOH WEEEE!!! Talk about good!!! mmmmm you must know I’ve been thinking of going to NOLA for some of these! Now I can just go to your house! Anytime birthday boy!!! Come on! !